For the third year in a row, my library is conducting a One Book program. The way we choose the book is to have a committee narrow down all suggestions to three finalists, and then let townspeople vote (today, election day) to decide the winner. The voting is done by visiting the schools and passing out ballots, and also by setting up tables at some of the actual polling places around town. We do this not only to get the townspeople to vote, but also to raise awareness of the program and the library. This year, we're also doing online voting. We created a "ballot" on our website (more on this below), and also set up a "voting booth" just inside the the library's front door. We evaluated five different options for free online polls, and in the end decided to use PollDaddy (it's also what Elizabeth Thomsen recommends). I want to point out that all of these polling websites provided the code to embed the poll right in our website (an example of making the library website more interactive and interesting by providing "information in context"). Each poll also had pros and cons, and here's a quick rundown of what we liked and didn't like. Keep in mind that these preferences are based on our needs for running a voting project - for a different kind of poll, we'd have different criteria. So based on these criteria, we went with PollDaddy. The only major omission after I got everything set up was that there was nowhere to include summaries of the books (unless it was part of the book cover image). Because of this, each ballot had to be two columns, one with summaries and one with the voting. Not perfect, but acceptable. Something else I liked about PollDaddy were all the options it offered, and we had to use them differently in this case. Although our website ballot and library voting booth ballot essentially look the same, I had to create different polls to run each. 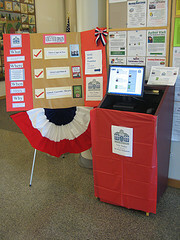 The reason for this is that we don't allow multiple votes on the website ballot, but since we're using the same computer for the library voting booth (shown here), we did need to allow multiple voting. Other settings we're using for these polls are to randomize the answers, set a closing date of midnight tonight, turn off comments (un-2.0, I know, but comments are not needed in this case), and to embed the book covers to make checking the right radio button easier. I really like that the results are displayed on the same page as the ballot, so the patron is always within our website, and isn't exposed to someone else's advertisements. So far, the polls have been open for about four hours, and the voting is going well. The library voting booth is definitely attracting attention. Not only am I looking forward to finding out which book won, but also how many votes we get through the website.